Maximum performance for highest requirements: the Life Fitness indoor cycle IC8 Power Trainer. 3800 Watt top resistance, perfect ergonomics, high-quality components - the new IC8 of Life Fitness Powered by ICG impresses by its performance features and equipment. 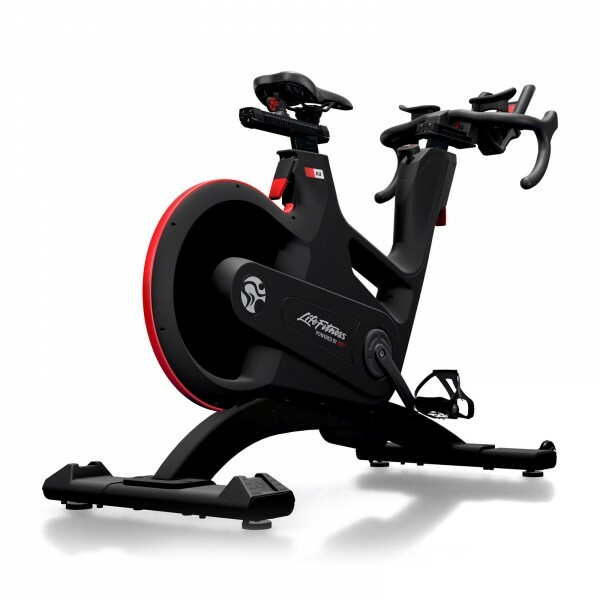 Being inspired by the requirements of diverse top athletes, this indoor cycle is designed and produced at the highest standard. You have a realistic cycling experience on the IC8 and you can measure, analyse, and adjust your performance thanks to precise performance features. Using the training computer, you have a quick and clear access to all performance parameters without having to change your cycling position - with the IC8, you can constantly push your envelope and beyond. The drive system of the Life Fitness indoor cycle IC8 Power Trainer is a combination of chain and belt drive. Cycling experience and pedalling are like that of a road racing cycle. Thanks to the freewheel function, you have the possibility of recovery phases to start a powerful pedalling with the next rotation. The resistance of up to 3800 Watt is infinitely controlled via a 300° control knob. The powerful and very modern magnetic brake responds directly to changes and offers an extremely authentic cycling experience. The optimal training position is essential for an optimal, efficient training without false stress. Choosing the Life Fitness indoor cycle IC8 Power Trainer, you can infinitely variably adjust in vertical and horizontal direction. The handlebar is a combination of racing cycle and triathlon handlebar. It offers diverse grip options on the lower and upper handlebar and also the typical racing cycle position thanks to the supports for elbows and forearms. The seatpost can be easily and precisely adjusted in height thanks to the gas spring. The Unisex racing cycle saddle offers a good stability and is mounted on an adjustable sled. Thanks to it, you can individually adjust the space of the handlebar - and you can find your ideal position. The precise measurings of the WattRate Direct Power Meter are clearly shown on the TFT display. The Power Meter directly measures leg independent the data via photo cells on the bottom bracket axis, whereby the measuring fault tolerance is just +/-1 %. Due to the independent measuring of legs, you can monitor the power effect of the legs on the pedals in real time. Dysbalances are directly shown and help to orientate and adjust in order to have an even load on both legs. The user can choose between six views, in which the training data are differently displayed. It is also possible in a coloured mode, whereby the measured data are even more outstandingly presented. Life Fitness indoor cycle IC8 Power Trainer add to comparison list.